One of my favorite workshops at ACFW conference this year was called Life Free, Write Free, presented by Allen Arnold, former VP in Thomas Nelson, and James (Jim) Rupart, super cool author. The point of the workshop was basically to not only life a life free to serve Jesus, but to write free as well. Free from a jammed pack schedule that puts us into a box. Free from our preconceived ideas about what we should write, thus opening up to follow what God wants us to do, and not what our schedule desires of us. There was a lot more to it, and I had to miss some of it, but it was just a REALLY good reminder for me not to be stuck into one way of doing things, but to be open to following where God leads. At the end of the class, they told us all that they had a project for us. The project would require a time committment of 3 to 4 hours over the next week. Time is NOT something I have a ready supply of, but I figured as long as I could do it with a baby on my hip, I’d be fine. Plus, they were only going to tell tohse who “accepted” what the project was. And this girl was super curious! So after a handful of people who weren’t going to have the time left, they handed out notebooks to each of us. They noted that they had prayed over each notebook and asked God to give them something to write in each of them. So the night before, in their hotel room, they’d written either a word, sentence, or paragraph on the first page of each book. Their task for us was then to take the notebook and prayerfully ask God what he was trying to speak to us through it, and to spend some time writing in the notebook about what that word meant to us. So, they handed out the notebooks, and we all went on our merry way. Later in the day, I realized I hadn’t read my “word” yet. In my hotel room, I opened up the notebook, a little nervous about its content. When I read the sentence it contained, I plopped down on the bed and let out a big relieved, happy, contented sigh. Your stories make me smile. On the surface, this is super cool because I write humorous romance. I struggle greatly with not feeling “good” enough. I’m my own worst critic, and beat myself up over small things ALL THE TIME. Even having a book published, I have a hard time not convincing myself that it was all a fluke. And my heart felt like it would completely burst out of my chest. I wrote stories that made Jesus smile. HOW COOL IS THAT! Another thing: I tend to over analyze the bajeebers out of things. I know, I know, the project was to spend 3 to 4 hours praying about it and writing about what it meant to me. But I do that waaaaaaaayyyyyyyyyyy too much as it is. Not the praying part (can’t ever pray too much!) but the analyzing part. My word was so cool because it was simple and spoke exactly to me. Nothing to over-think or to misapply or to twist in this way or that. My stories make Jesus smile. That’s it. Now, remember the whole notebook switcheroo? 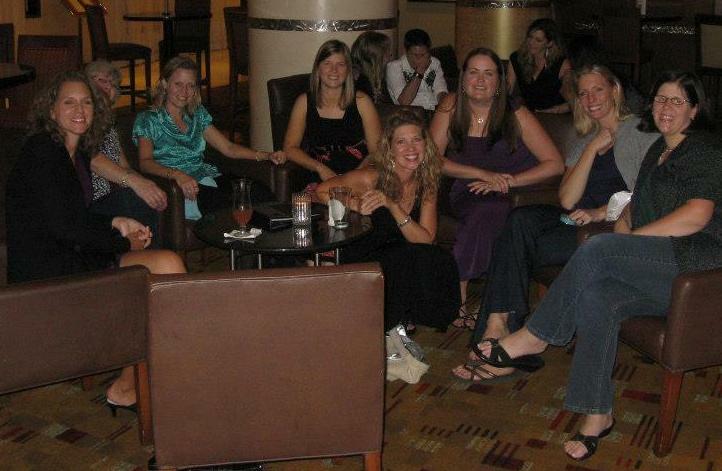 Our Saturday night group… Katie and I are on the right! I’d name the rest of them but afraid I’ll botch up some spelling!! Saturday night, a group of us were all sitting around the lounge, and Katie was sitting next to me. I asked her if she’d read her notebook, and she’d said yeah, and also had noticed that Allen had not picked the notebook from the top and thought it odd. We swapped “words” and were both pretty in awe. I don’t remember what it was exactly, but something about needing to look at alternate paths and to pray about it and go down one or something or other. Katie had this fantastic response to it, saying that she wasn’t sure what God was saying exactly, but she was excited to spend some time in prayer about it. FYI. I probably would have taken the next flight out of Dallas, assuming that I was totally failing and that I’d gone down a wrong path, etc etc. I told you I tend to over analyze…. Regardless, it was pretty clear that we each got the notebook that was intended for us. And I left conference with a very real reminder that first and foremost, above even the opinions of readers, my stories should make Jesus smile. HE is the audience I write for. And goodness… I just love making my “Big” Daddy smile, don’t you??!!! I've got my notebook right here, and the words penned inside were just what I needed to hear. All about freedom and my heart. Oh girl, this is an awesome post. 😉 It's pretty amazing the way God works things out. Wow, so happy for you, I almost cried. Hope Annabelle and the girls are good! We need an Annabelle and girls post! Wow! I've heard so many wonderful things about this workshop that I'm going to have to get a hold of the conference CD so I can listen to it. I love how the Lord worked things out so you got just the words you needed to hear, Krista. It's so cool when He surprises us like that–but not at all surprising that He does. I love the words in your notebook, and I echo them. I'm almost done reading Sandwich, with a Side of Romance, and I've smiled A LOT. It's a fun story, and I can't wait to reach The End. Hopefully tonight. Your stories make me smile too!! I can't tell you how many times I caught myself with a big grin on my face while reading your book! Loved reading this post, Krista. I just love how God speaks so personally to our hearts. And just an update….God has spoken very clearly about the message I received in that notebook. Even through another Bible study. It's not what I thought it first meant and it's really a message I needed to hear.